When computers were first introduced into our homes, they were designed to be functional, and not meant to be seen. Times have changed... almost as much attention is being paid to the way a computer looks as to how it functions. Thermaltake has taken this into consideration when designing new cases, one of their latest designs would look great in any room of the house. 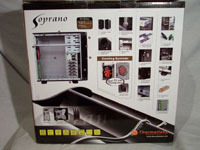 The case in question is the Thermaltake Soprano, and we'll see if it can perform as well as it looks. As with all of Thermaltake's retail packaging, the box that the Soprano resides in is colorful and provides ample information on the case inside. The front of the box gives you just a little snapshot of the case and its advantages. The backside of the box is where all the detailed information is. It gives you little pictures of what this case has to offer. Opening the box, there is very little difference in the way this case is packaged from other case packaging. 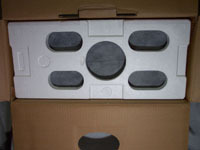 The case sits between two large fitted Styrofoam pieces. 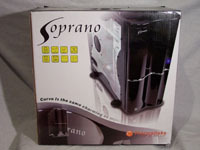 Usually cases are then enclosed in a plastic bag, but the Soprano is enclosed in a cloth bag that helps protect the paint finish from scratches.